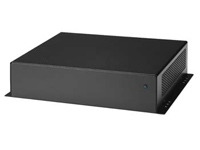 Compact and Rugged Wall Mountable case suitable for all non-socket Mini-ITX Boards - Universal 110-240V operation. Constructed from steel and lightweight aluminium and measuring just 59 x 260 x 186mm (HxWxD). This case is ideal for POS or Kiosk applications, or for any application where a discreet and securable case is required. Now includes mounting bracket for 2.5in HDD (SATA recommended). Or why not make a fanless solid state system and boot over a network, or from IDE Flash Module. Power supply: 110-240V External Universal 60W AC Adapter and UK power cord; 62W Internal DC power board. Cooling: 2x quiet internal 40mm cooling fans connected to a single fan header.